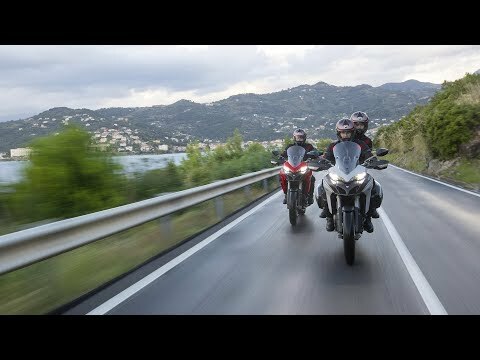 With the new Multistrada 950, you can experience the beauty of the journey every day, thanks to versatility that make it ideal for every use. 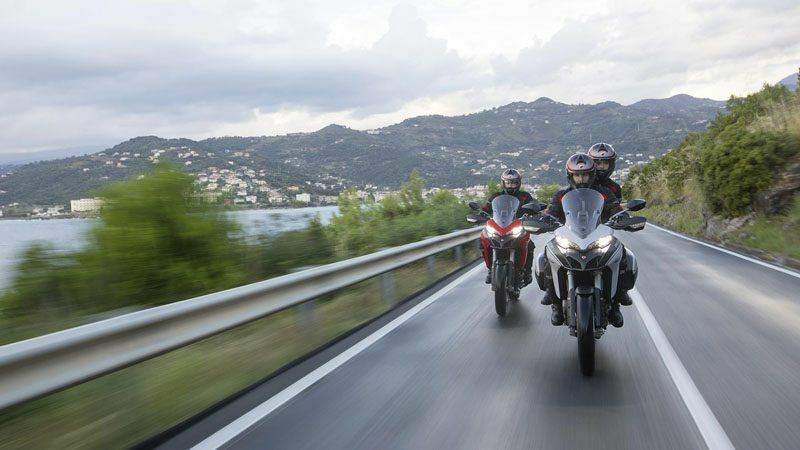 The limited weight and 840 mm seat height ensure agility and ease of riding, whereas the advanced technology guarantees maximum safety in all conditions. 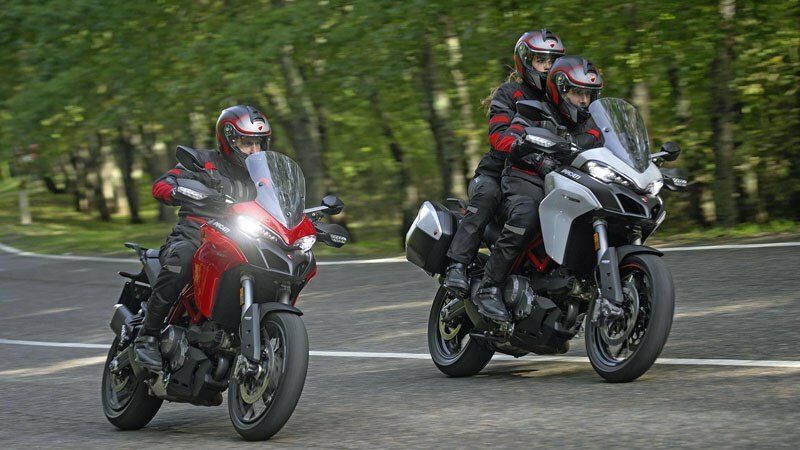 The following features include information for all models within the Multistrada 950 Family and may not be applicable to all models. 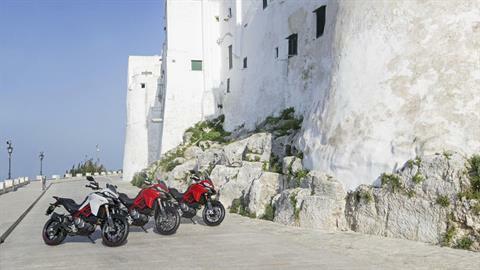 Please see your local dealer for further information. FRAME: The Multistrada 950 features minimum ground clearance of 183.5 mm. The 1,594 mm wheelbase ensures optimal load balance, which consists of the rider and the side panniers, where available, with ensuing benefits in terms of dynamic performance. 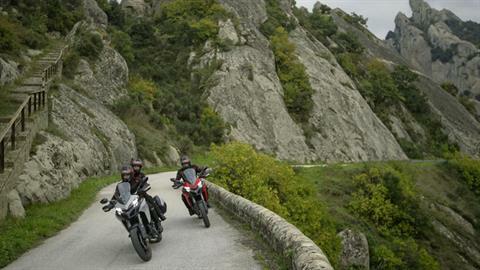 The new, lighter double-sided swinging arm is made of shell cast aluminium. 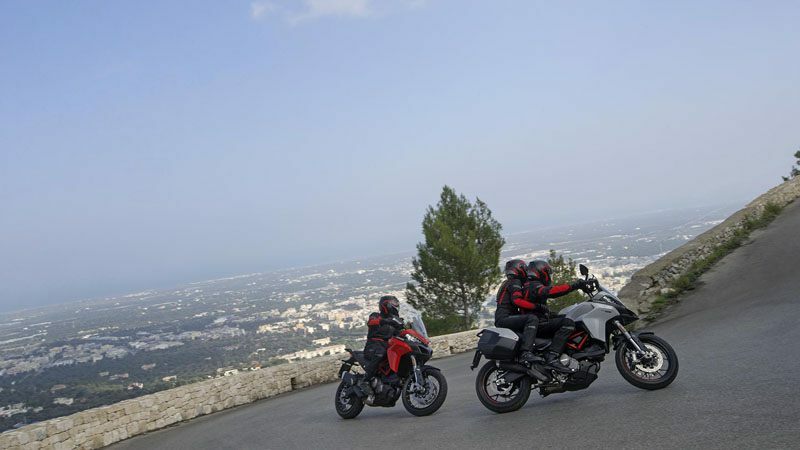 DUCATI SKYHOOK SUSPENSION (DSS) EVO: The DSS Evo system acts continuously to guarantee the perfect balance of the vehicle in all road and load conditions, providing both rider and passenger with maximum comfort. 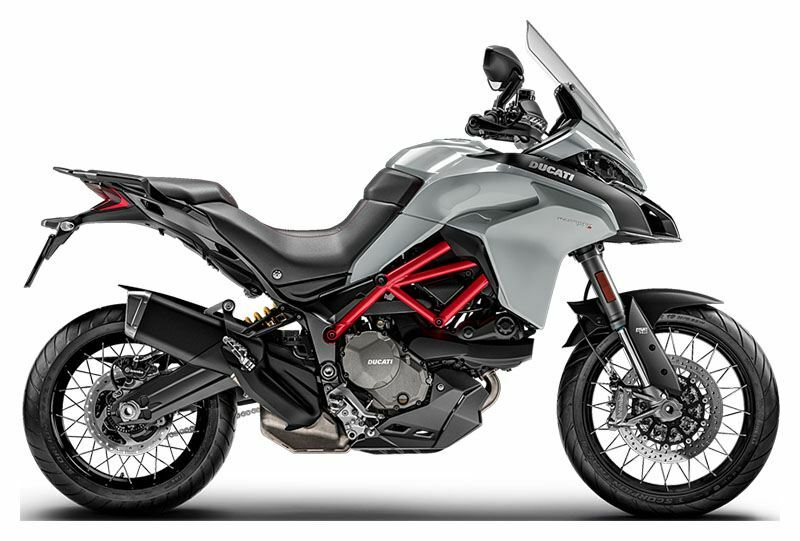 The DSS Evo system makes it possible to vary the bike's setup in a practical, intuitive and quick manner using the new HMI interface, to have the ideal suspension in any conditions. 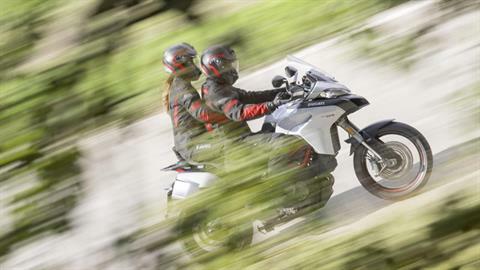 Simply select the riding mode – Touring, Sport, Urban or Enduro – and the load condition – single rider, rider with panniers, rider with passenger and rider with passenger and panniers. 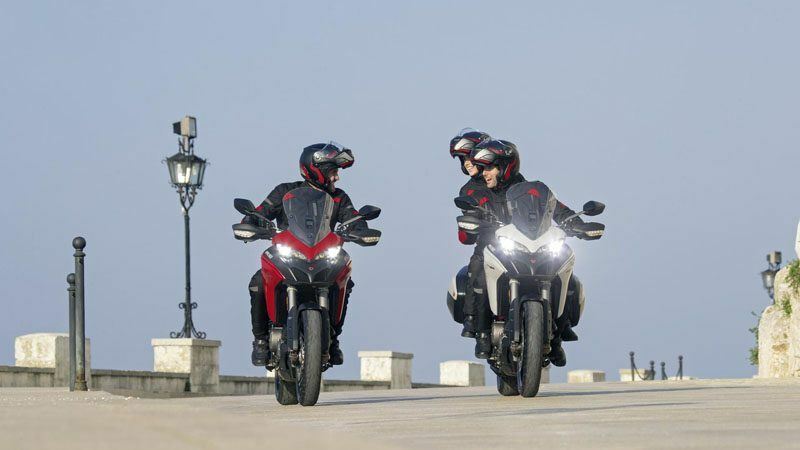 Moreover, it is also possible to act separately on the fork and on the shock absorber to make a fine adjustment of the front and rear suspension without the need for complicated settings. 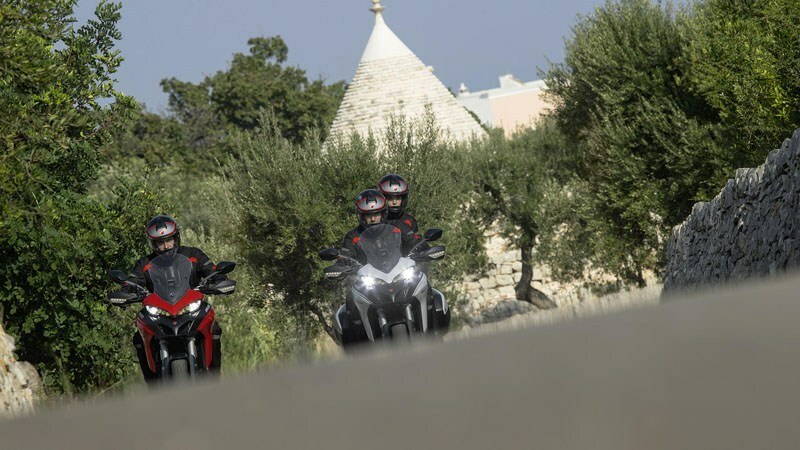 The system configuration possibilities are almost unlimited and there are up to 400 combinations of the parameters that can be electronically selected by the rider via the new interface. 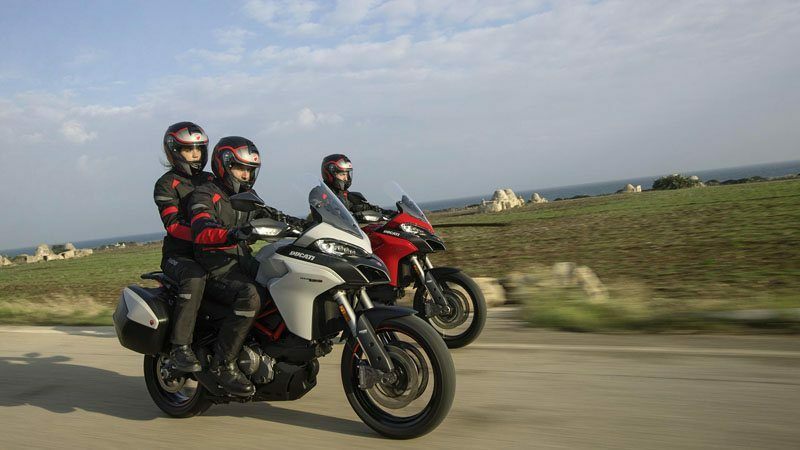 TIRES AND RIMS: This tyre was designed for the most demanding riders; its strengths include durability, consistency of performance throughout its life cycle and top performance on wet surfaces. The Multistrada 950 S is available with alloy rims or in the version with tubeless spokes, aluminium grooves wheels featuring 40 crossing spokes and gravity cast hubs; it was developed and homologated with Pirelli Scorpion Rally studded tyres as well. TESTASTRETTA 11°: This engine can deliver a maximum power of 113 hp at 9,000 rpm, with maximum torque of 96 Nm at 7,750 rpm; the compression ratio is 12.6:1. The new Multistrada 950 engine breathes thanks to cylindrical-section throttle bodies with a diameter of 53 mm and a state of the art full Ride-by-Wire system. Maintenance intervals are expected to be every 15,000 km (or 12 months), while valve play must be checked every 30,000 km. DUCATI QUICKSHIFT (DQS): The system works both when upshifting, for full throttle racing accelerations, and downshifting, with the reduction being more fluid thanks to the "blipper" that harmonises the engine's revolutions with the rotation speed of the primary shaft to avoid jamming, all supported by a clutch with anti-hop system. 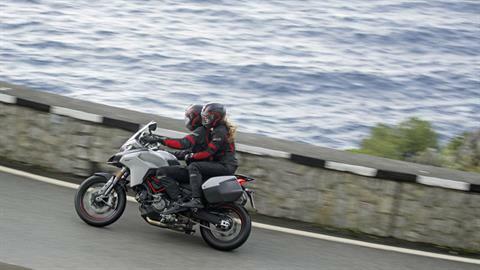 DQS is available as an accessory on Multistrada 950. 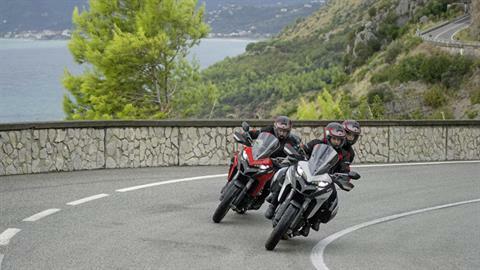 HYDRAULIC CLUTCH: The new Multistrada 950 is equipped with a wet clutch with self-servo action and anti-hop function. Its new hydraulic control system with adjustable lever help reduce lever effort. Because of this, the new Multistrada 950 is easier on the gears, especially on city streets where acceleration and downshifting are more frequent. EXHAUST SYSTEM: The exhaust system layout consists of two primary manifolds converging directly into the 2-chamber muffler that acts as a union, houses the catalytic converter and ends with a single side tailpipe, which was redesigned and made smaller in order to optimize performance and noise output. 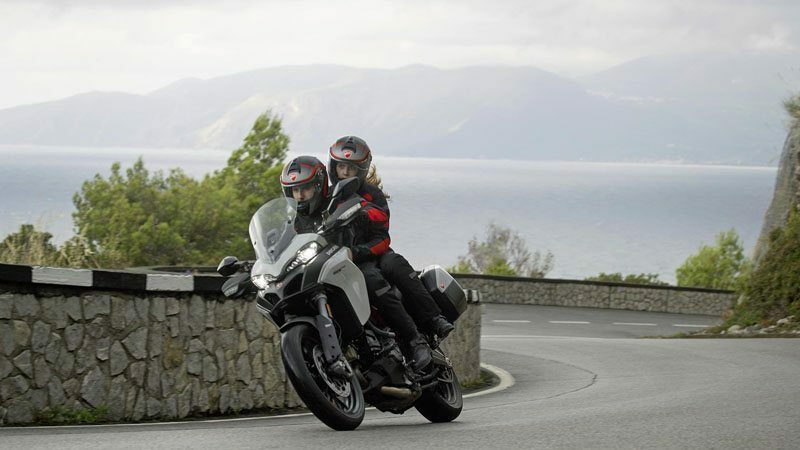 BOSCH ABS CORNERING: The new Multistrada 950 is equipped with the Brembo braking system fitted with the ABS 9.1ME Cornering device, an integral part of the Ducati Safety Pack (DSP) together with Traction Control. DUCATI TRACTION CONTROL (DTC): The system allows to choose among 8 different profiles, each of which has been calibrated to offer a tolerance to rear slippage commensurate with progressive levels of riding ability. VEHICLE HOLD CONTROL (VHC): This feature is activated when the motorcycle is at a standstill with the side stand retracted, and the rider applies high pressure to the front brake lever or the rear brake pedal. Front - Tubeless spoked wheel in light alloy 3.0 x 19 in. Rear - Tubeless spoked wheel in light alloy 4.5 x 17 in.